Sophia, like so many Southern West Virginia coal towns, was little more than howling wilderness before the arrival of the coal industry. It was not until 1843 that the first known settlers moved into the area, then part of Fayette County. In that year Pyrrhus McGinnis and Conrad Riffe received land grants along Soak Creek, the former for 2,500 acres. McGinnis moved his family into a log cabin he built with the help of his son, and eventually sired a long line of Raleigh County lawyers. A few houses and a saw mill sprung-up around the McGinnis settlement and a post office was established there in 1877. One of the first postmasters was Conrad Riffe, but, according to one account, it was difficult to get anyone else to serve, and the position was passed around to all original inhabitants of the area until the office was discontinued. Perhaps the name of the post office had some role in its demise. The area was known as Soakass Creek until near the end of the 19th century. A humorous incident led to this unfortunate name. According to an account by an early settler, a group of hunters were traveling along the creek, and one, toting a deer on his back, tumbled into the stream. Other Creek. The name stuck, though later it was shortened by more respectable newcomers.members of the party, witnessing the distress of the hunter sitting in the cold water, laughed and named the stream Soakass Until the construction of the railroad and the onset of the coal industry, the Soak Creek had only a saw mill, a few houses, and a grocery store. The opening of the Winding Gulf Coalfield in 1907 led to a coal boom that spilled-over into Soak Creek and literally put Sophia on the map. Winding Gulf is one of the three “smokeless” coalfields, where production comes from the coal seams of the Pottsville geological series. It was one of the last coalfields in the state to be developed. It is also the smallest, encompassing only the Winding Gulf, Piney Creek, and Slab Fork sections of Raleigh and Wyoming counties. About the same time, the newly formed railway, the Virginian Railroad, paved the way for the development of the Winding Gulf and in 1912 Sophia was incorporated. Sophia continued to experience growth and prosperity through the 1940’s and the 1950’s. 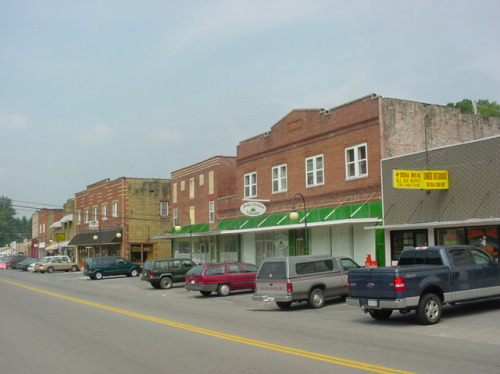 Sophia was one of the fastest growing towns in the state and during the 1950’s became the third largest town in Raleigh County. As the downfall of the coal industry took its toll on other coal and railroad communities, Sophia was not exempt from decline and economic repression. Today Sophia is largely a residential community. Though local efforts are being implemented to preserve the cultural history of the town, residents continue to work toward the revitalization of its commercial section along Main Street. Designated as a National Historic District in 2006, evidence of this once booming town’s glory days is still visible to the visitor. Town hall is poised on the hillside as you enter the town and is reminiscent of the town’s architecture. Stone and brick buildings erected during the early 1920’s grace main street. Buildings on both sides of the street are currently under renovation to their former state to retain the character of the town. For more information on these and other sites call 304-683-9802.